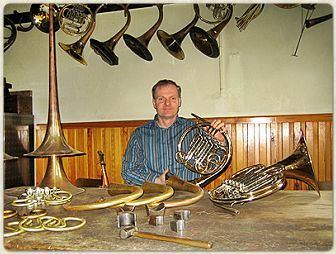 All of the single and double French Horns that bear the name "Herbert Fritz Knopf" are individually crafted in the master horn maker's workshop using proven designs and the finest of materials. Christian Knopf in seiner Werkstatt Spanning more than 150 years since 1852, five generations of the Knopf family have been introducing innovating horn designs and refining manufacturing techniques. Today the Knopf master horn maker collaborates closely with horn players from around the world to build horns that fulfill the most stringent of musical demands. The premier "Knopf Model" double horn is famous for its high quality, mellow and centered tone, responsiveness, and positive intonation. It speaks easily in the high registers and produces full-bodies pedal-tones. The "Knopf" can also be customized to meet specialized requirements. While targeting primarily for professional use, it is equally suited for advanced players and students. Contact the firm to obtain a prospectus describing its full range of hand-crafted French Horns and customization services.